Oil Guessing Game | Help! I live with my Italian mother in law! This photo was taken at 4:00 pm. By 7:00 pm it was full to the rim! I have some stats on the oil production and some people have asked some interesting questions about the process etc. So, I will attempt to share what knowledge has been passed on to me via my husband to shed some light on the subject. Please note, that even though I have been doing this for several years, I still consider myself a bit of a rookie on the subject so if I get something incorrect, forgive me. Our house is on Portofino mountain in the Lugurian region of Genoa, Italy. The flavour of the oil varies from region to region. Ours has a stronger taste than my friend’s in-laws, who have an olive grove inland in Montalto, which is still technically Liguria. My experience is that Tuscan oil is a bit smoother tasting. I personally like both. Our trees (about 300 of them!) are hundreds of years old and we have a few different varieties. Most of them are small and not typically used for jarring and eating although many of the locals here do it. We do not put any pesticides on our trees, they are 100% organic. If you prune the trees, the quality will increase immensely and they are easier to pick too. Pruning happens in the Springtime. The fact that we use no pesticides means that we will get bugs in them. This is normal and they exit the olives as soon as you remove them from the tree. They are also washed at the mill. However, the bugs put tiny holes in the olives and so we don’t pickle ours. 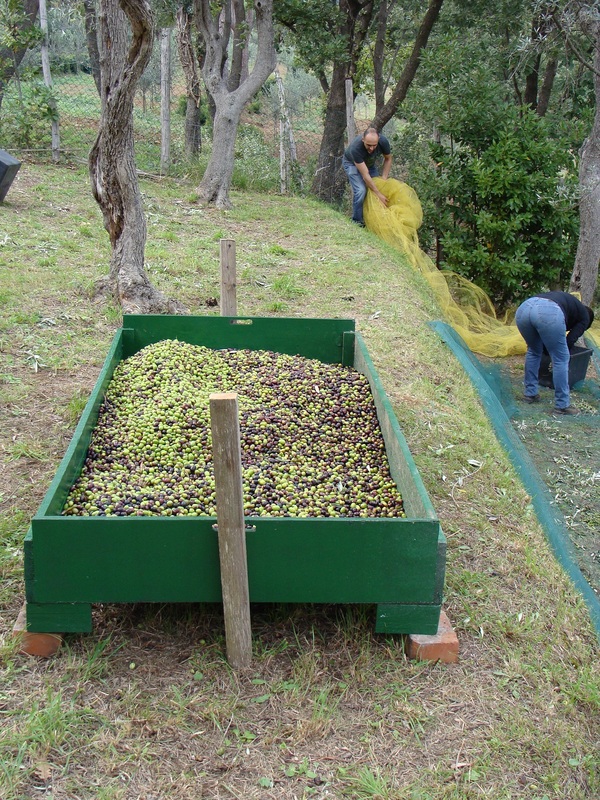 We must pick the olives consecutively or they will start to ferment and get a bitter taste. In the past, when it was just my husband and myself, we would pick for 3-4 days straight then press at a local mill. Last year, and this year, we recruited friends and family to help us and we got it all done in one day (there were 10 adults and 2 children). We drop nets on the ground and beat the trees. Some farms hang their nets and collect what drops naturally. We don’t do this because my husband’s vacation time from the ship is too short and we have too many other obligations while he is home. Our trees are on multiple levels, we are on a mountain remember 🙂 The trees at the very top of the property have the best olives because they get the most sunshine. YEAR 2006: ? don’t recall how many Kilos = 13 Litres of oil (it was my first year picking and the trees had been abandoned for several years so we did not get a very good crop). Have fun and fill out the poll…maybe there will even be a prize if you win! This entry was posted in Food, Italian Culture, Nature, Tourists, travel and tagged game, guess how many kilos, olive oil, Portofino. Bookmark the permalink.